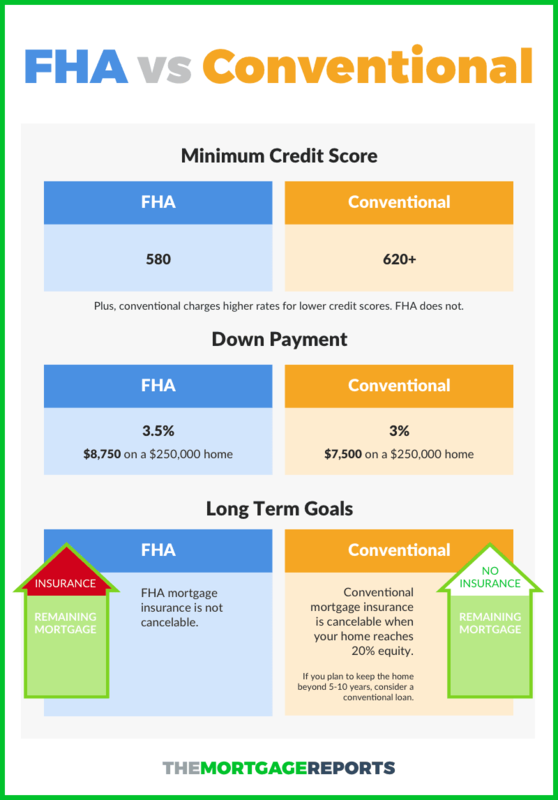 The FHA vs Conventional question involves examining your 1) credit score; 2) available down payment; 3) long-term goals. 1) Credit score: Buyers with low-to-average credit scores may be better suited for an FHA loan. FHA mortgage rates are lower than conventional ones for applicants with “dinged” credit, and FHA loans allow credit scores down to 580. 2) Down payment: You get a lower down payment option with conventional, at just 3% down. FHA requires three-and-a-half percent down. 3) Long-term goals: Conventional mortgage insurance is cancelable when your home achieves 20% equity. FHA mortgage insurance is payable for the life of the loan and can only be canceled with a refinance. Buyers who plan to stay in the home five to ten years may opt for conventional. There are a multitude of low-downpayment options for today’s home buyers but many will choose between the FHA 3.5% downpayment program and the Conventional 97. FHA loans are available with credit scores of 580 or better. The Conventional 97 loan, by contrast, requires a minimum credit score of 620. And, many conventional lenders require an even higher score than that. Therefore, if your credit score is between 580 and 620, the FHA loan is best for you because it’s your only available option. As your credit score increases, though, the Conventional 97 gets more attractive. Your mortgage rate drops (compared to low-credit Conventional 97 rates) and your PMI costs do, too. This is different from how FHA loans work. Therefore, over the long-term. borrowers with above-average credit score will typically find Conventional 97 loans more economical relative to FHA ones. Assuming a loan size of $250,000 and today’s mortgage rates, FHA loans are 10% cheaper for borrowers with “excellent” credit scores. For borrowers with weak credit, they’re 26% cheaper. But, this doesn’t mean FHA loans are best. Remember: FHA MIP is forever but Conventional 97 mortgage insurance goes away at 80% loan-to-value. This means that, over time, your Conventional 97 can become a better value — especially for borrowers with high credit scores. The FHA charges a separate mortgage insurance premium at the time of closing known as Upfront MIP. Upfront MIP costs 1.75% of your loan size, is added to your balance, and is non-recoverable except via the FHA Streamline Refinance. Today's mortgage rates are low and rents are rising nationwide. In many U.S. markets, the answer to “Should I rent or should I buy?” has shifted toward “buy”. Even better — first-time home buyers have ready access to low-down payment loans. Recently, mortgage lenders reduced minimum credit score requirements for the FHA’s popular 3.5% downpayment loan; and, two 3% down payment programs have been retooled — the Conventional 97 and the Fannie Mae HomeReady™ mortgage. For many buyers, though, the choice among low-downpayment loans will be between the FHA loan and the Conventional 97. This is because VA loans are available to military borrowers only; USDA loans are restricted to suburban and rural areas, with maximum income limits; and HomeReady™ has similar income restrictions. 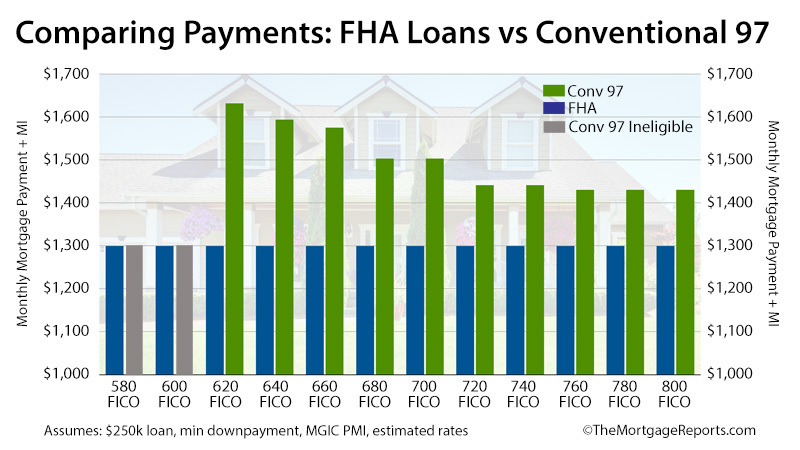 So, which is the better mortgage: the FHA loan or the Conventional 97? The Federal Housing Administration (FHA) is not a lender. Rather, it’s a loan insurer. The federal agency was established in 1934 and exists to support homeownership within communities. The FHA played a crucial role in the post-depression housing market. In the 1930s, it was difficult to get a home loan. Loan terms were for five years or less, which meant that loans were required to be “paid off” in 60 months or fewer; minimum downpayment amounts was set at 50% of the purchase price; and, homeowners were afforded little protection from cash-strapped banks which may have been forced to foreclose just to keep a strong balance sheet. Promising affordable and stable financing, the FHA established a program by which it would insure U.S. lenders against losses on a loan and provide more favorable loan terms for U.S. borrowers. More than 80 years later, the FHA continues to fulfill its role. FHA MIP varies by loan type and downpayment, with the most common scenario being a home buyer using a 30-year fixed rate FHA loan with the minimum allowable 3.5% downpayment; and paying 0.85 percent against the borrowed amount in mortgage insurance premiums annually, or $71 per month per $100,000 borrowed. The FHA is the largest insurer of mortgages in the world. It currently insures close to 1-in-4 new U.S. mortgages. The Conventional 97 loan is another low down payment option available to today’s mortgage borrowers. Available via Fannie Mae and Freddie Mac, the program was recently retooled to be cheaper and easier to use. This definition of first-time buyer means that consumers who lost a home to foreclosure last decade can be Conventional 97-eligible under the program’s new rules. Furthermore, because Conventional 97 allows for cash gifts for down payments, home buyers are not required to make a down payment from their own funds. Monies may be 100% gifted from parents and relatives. The only requirement is that the gift is actually a gift — down payment “loans” are disallowed. For eligible borrowers, the rules of the Conventional 97 program are straightforward. Beyond that, there is very little to distinguish a Conventional 97 loan from any other conventional mortgage type. Borrowers are required to verify income and employment; the program can be used to refinance a home; and, home buyer counseling is not required. For today’s low down payment home buyers, there are scenarios in which the FHA loan is what’s best for financing; and there are scenarios in which the Conventional 97 is the clear winner. Rates for both products should be reviewed and evaluated.